Energigas Sweden, a member-funded industry organisation that works to increase the use of energy gases, published statistics for 2011. A summation of the 2011 production and use of biogas shows that the proportion of biogas that goes to the automotive sector this year is by far the largest. 50% of the produced biogas is upgraded and is now used as a vehicle fuel. Altogether there are 233 biogas production plants of which 135 sewage treatment plants, 55 landfills, 19 co-digestion plants and five industrial gas plants. Farm biogas plants has increased by five and is now 19 in number. Sewage treatment plants still account for nearly half of the production. The co-digestion plants which include household waste, slaughterhouse waste and manure from farm biogas digested increased volume by almost 20 percent compared to 2010. The amount of biogas from landfills declined simultaneously. 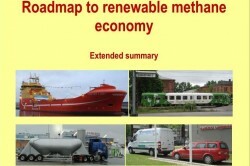 “Despite a glaring demand there is not enough increase in biogas productions. And it is the political signals and long-term rules of the game are missing. The government does not provide any information on the conditions in the future or on operational instruments to get this market,” says Anders Mathiasson, president Energigas Sweden.